Thinking I need a spacer. My question is two fold: I just want to confirm my logic that this added spacer will prevent any rubbing of the tire against the strut, and when the suspension is fully loaded in a turn, will the fender rub on the outside of the tire? Because adding that spacer will most likely bring my sidewall even with my fender. I have never dealt with spacers before so I have no idea if they should be used in this application. Thanks for the help and let me know if you need further clarification. You think I'll have fender rubbing on the track too? Well damn. I have no idea what I'm going to do then. Looks like I'll read up on fender rolling. I bought the Forgestar 18x10 and am currently running 285s. But next year I plan on running 295s on all four corners. I have a 3mm spacer just in case the front rubs some but I might not need it. I doubt that tire and rim calculator is good enough for this situation. 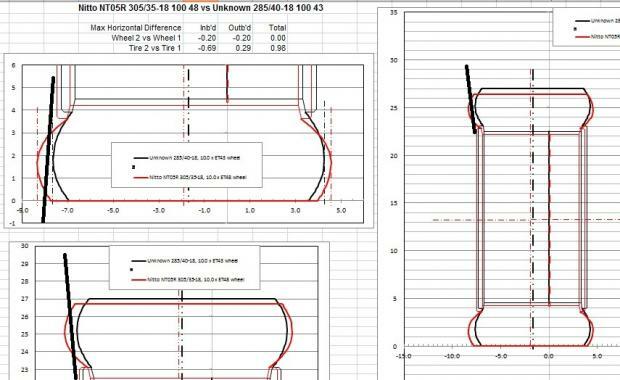 Tires gain section width as the rims they're mounted on are widened above the tire size's "measuring width" (and "lose" a little section width on wheels narrower than measuring width), and this is not considered by that online tool. Don't feel bad - none of the others are any better. I can plot this up more accurately considering the above, with one tire and wheel overlaid one on top of the other so you can see the differences better. But I'd need to have exact, verified measurements and the tire mfrs/models. For example, I'm pretty sure that the GT500 wheels are 18 x 9.5", ET+45. Clones may or may not be the same, so if the name of the GT500 clone mfr and the dimensions were verified that would help a lot. I also just noticed ur current tire diameter is smaller than stock 27.1 and is 26.7 and the wider tires are 26.4. U will have some speedo issues which can be corrected with a tuner. I run a 285/40/18 tire on a 10 wide rim with an ET 43mm offset, with a 1.25 inch drop and -1.4 degrees of camber. I do not rub on the suspension and have maybe 5-6 mm clearance on the shock housing. U want to run a tire that theoretically is 10 mm closer to the suspension and is 5 mm closer still with an offset of 48. Ur proposed new tire and wheel combo won't just rub against the suspension, it will rest against it. U will likely need a 15 mm spacer and that will make ur wheel stick out past the fender as well, mine is nearly flush with the fender. I would find different wheels and narrower tires, like 295 on a rim that is 10 wide with a 38-40 mm offset. I wouldn't even bother. 26.7" is less than 1 mph off @ 60 mph, and 26.4" is only about 1.5 mph off. Thanks for the real-world data point. It's more timely than you might guess. OP would be looking at not just a little light contact but almost half an inch tire to strut interference. His compared to yours below, with a strut line included for reference. I guessed at his tires being NT05R's. Last edited by Norm Peterson; 03-11-2014 at 07:51 AM. I run Nitto NT555 which I hear run a little narrower than advertised. Quick Reply: Thinking I need a spacer.